COSMOSMotion simulates the mechanical operations of motorized assemblies and the physical forces they generate. By determining factors such as power consumption and interference between moving parts, COSMOSMotion helps you ascertain if your designs will fail, when parts will break, and whether or not they will cause safety hazards. Leverage the power of SolidWorks. 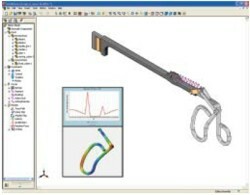 COSMOSMotion works inside SolidWorks window and uses existing assembly information to build motion simulation studies. Automatic transfer of material properties defined in SolidWorks. Re-use physical simulation data in COSMOSMotion for realistic physics based motion simulation. Transfer loads seamlessly into COSMOSWorks to perform stress analysis. With the seamless transfer of loads from COSMOSMotion to COSMOSWorks, you can visualize stress and displacements, on a component, at a single time instance or for the entire simulation cycle. By combining physics based motion with assembly information from SolidWorks, COSMOSMotion can be used in a broad span of industry applications. Estimate peak motor torque when performing tasks like positioning antenna reflectors, opening and closing security gates, handling materials, and raising and lowering scissors-type lift tables. Also see how friction can increase power requirements and actuator size. Understand robotics performance during operation, for example installing windshields, pick and place electronic components on circuit boards in electronics plants. Optimize or minimize the force imbalance of a rotating system in orbital sanders, sewing machine, shaker beds, drive-shafts, etc. Change the design length of backhoe linkages to provide better digging performance. Generate CAM curves (profiles) employed in automatic feed mechanisms and screw machines. Represent interactions between various gears (spurs, work, helical, and rack-andpinion) used in different kinds of power transmission or motion control. Perform basic suspension tuning for racing applications. Associate physics-based models to engineering conditions. COSMOSMotion offers several types of joint and force options to represent real-life operating conditions. Create various compound joints to represent conditions like hinge, screw, spherical, cylindrical, planar and universal. Construct joint primitives to enforce standard geometric constraints. Use action-only force to control the acceleration rate and velocity when designing actuators. Apply constant, harmonic, data points (spline), and step forcing functions to joints and forces. Create joint couplers (kinematic gears) to allow motion between various types of gears for power transmission. Define linear- and non-linear springs in applications lacking torsional and flexural rigidity when extended. Represent action/reaction forces and moments. Use point-to-curve and curve-to-curve (with static and dynamic friction) to represent CAM constraints. Define 3D contacts (with static and dynamic friction) to capture interaction between two or more contacting parts. Use isotropic- or orthotropic-bushings to give flexibility to mechanical joints. Include the effect of gravity. Once you have completed the motion simulation run, COSMOSMotion offers a variety of results visualization tools that allow you to gain valuable insight into the performance of your design. Create XY plots of numerical data for the entire simulation cycle. Represent multiple XY plots in the same graph. Display displacement, velocity, acceleration, and force vectors at joint locations. Display trace of any point of the body during simulation and generate a reference curve directly on a SolidWorks part. Compare plots for different design to allow you to build up a history of information on how results vary within the assembly. Check for colliding parts while the assembly moves. Animate a representation of the 3D spring during simulation. Use COSMOSMotion AVI or VRML formats to capture and communicate the physical motion to others. Generated graphs with numerical data in Microsoft Excel format in any coordinate system. Export graphs using a different reference frame (part).